LEGO artist HAZEL is a bit more industrious than the guy who set half a LEGO minifig on fire and called it Two-Face. 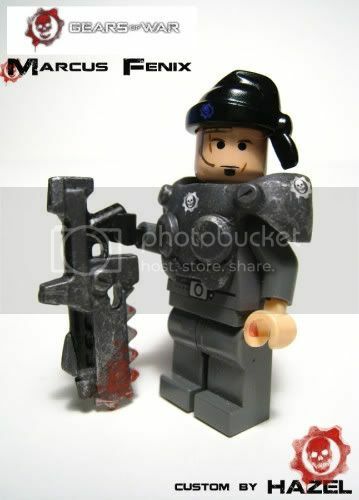 HAZEL customizes everything on his minifigs, right down to the armor and weapons you see on all the Gears of War cutoms in this Flickr set. 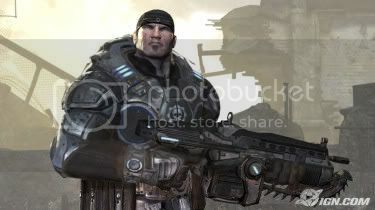 But my favorite from the set has to be this custom minifig of Marcus Fenix, the main and unironically-goateed protagonist in Gears of War. Not just because he’s wielding a LEGO chainsaw gun, the most fearsome LEGO weapon ever to be stained with the acrylic-tasting blood of many a sacrificial Power Ranger action figure. No, it’s because he’s sporting a beehive hairdo (with convenient carrying strap!) in place of a bandana. See… dudes who carry bloody chainsaw guns can get away with that sort of thing. You wouldn’t see me trying something like that. The ballsiest thing I did today was take potshots at someone else’s craft from the safety of my internet anonymity. Thanks to Brothers Brick for the find.